Bridget, from the gorgeous blog The Way the Cookie Crumbles, chose Dorie’s Lemon Cup Custard for TWD this week. I opted to go for the lemon-clove “Playing Around” suggestion in the book, and since it is a cup custard, I naturally baked mine in a cup. I actually don’t have too much to say on this one, but there was a lot of talk (mostly not-so-positive) on the comment board. For group members who didn’t like the recipe, the main problem was the “egginess” of the custard. I happen to love eggy custards. In fact, I chose Dorie’s flan when my turn to pick came around last March (I was worried that if I didn’t, no one would!). These little cups are prepared similarly to flan custard, and their texture and eggy taste did remind me of flan. But without the caramel sauce, they were rather unremarkable. This recipe was not bad by any means, just a bit boring. If you’d like to check it out for yourself, read The Way the Cookie Crumbles or see Baking: From My Home to Yours by Dorie Greenspan for the recipe. Don’t forget to scroll through the TWD Blogroll. Well, your pictures look fabulous even if you thought the dessert was boring! I added actual lemon juice to mine because of all of the comments in the P & Q section, and I loved it! Beautiful looking, lemon and blueberries are surprisingly a great combo. Glad you liked making it, since it’s gorgeous!! I didn’t mind the custard either.. funny that so many people were up in arms about this one! This one was a little underwhelming, wasn’t it? I love how you made yours in coffee cups. So cute! Sorry you weren’t a fan, but I LOVE that you baked it in a cup! Your presentation is just stunning! 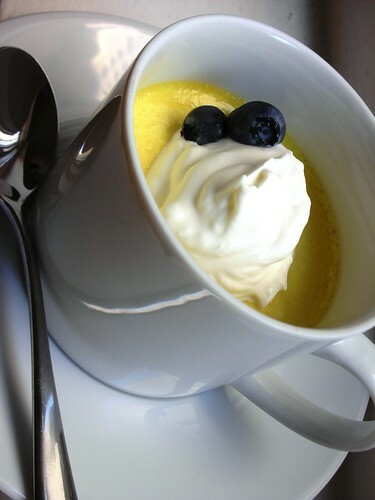 Very pretty presentation, and I love the intense yellow color of your custard! I’m not a custard person, so I took a different approach to the ingredients. Great job Steph!! Man, I remember the flan. It was just before I joined and I was bummed to miss it – I love flan. I guess we just don’t have many Mexican cuisine dedicates around. I’ll make it sometime, I will. I was tempted by the clove variation. Looks wonderful. I love that you made it in an actual cup. Like the cup & berries. It’s getting warmer, next week or 2 after? I wish the recipe had called for some caramel sauce to spruce up your custards! Either way, the custards turned out beautifully! And I’m so glad you were pleased!! I bet these were delicious! I absolutely love your pictures!! Your custard cups look gorgeous. I love the way you presented them with blueberries and whipped cream. boring huh? if i’m ever tempted to try this recipe. I’ll probably pop sugared blueberries at the bottom of the cup just for the sake of seeing some dynamite colors. hehe. Beautiful colors, Steph! Crips, clean and clear… strange… that’s how I imagine your taste to be – modern, classic, vertical more than horizontal and frill-free! LOL …could I be right? Anyways… I’m sorry though, your custard generated negative comments… I thought it was pretty good. It looks lovely, even if the taste wasn’t all you hoped for! Oh, sorry you (and several others apparently, didn’t like it. I did, but then I like custard. Cute pic in the cup and love the blueberry decor. Pretty. It’s fun to see people making these in mugs – I wasn’t sure mugs are oven-safe. I agree that the lemon flavor was tame, but now I’m curious to check out some other flavors. I love your photos–the blueberry garnish looks beautiful! I tried the clove addition as well. I didnt like them, but maybe I should have put some whipped cream on top! Anything is better with whipped cream! Still makes a great photo! I thought it was a little boring too. It needed a sauce of some sort. Great job on your custard! I love that you baked them in cups! the photos look great, i love the whipped cream and the blueberries. i still have your flan pick to make up which i plan on doing soon. I didn’t think I really cared a lot for this recipe, but now seeing your photos I feel like I MUST…they look so lovely with the cream and blueberries. I better try that version…blueberries and cream always add a little something. Beautiful job…great photos. Stunning as always Steph. They look adorable. I’m a flan lover too and am wondering if this custard would be good drizzled with a ton of caramel sauce…I might try it. I like the idea of clove and lemon. mmm i love lemon flavored things! I made the caramel topped flan this week, along with the custard. I have to admit I liked the flan better, but still, I wasn’t in with the custard haters, LOL. 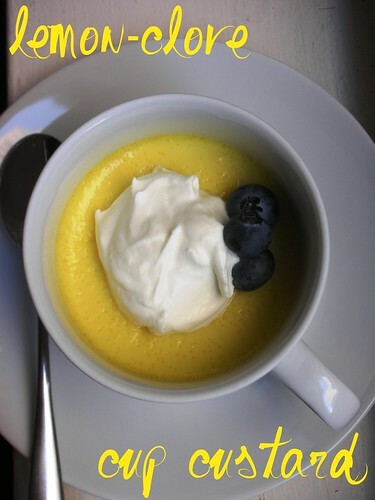 Your lemon custard looks perfect! I love that you made them in cups! How perfect! I always love how your photos turn out! Beautiful! Wow, your photos are amazing. The colors are so vibrant! This wasn’t my favorite recipe either but at least we tried. Oh, I wish I had been a member of TWD when you did the flan. I’ll have to check out the recipe in Baking. I love flan. But I didn’t really love this recipe, either. I think sweet, eggy, creamy is a winning taste sensation. I love the brilliant yellow color of your custard. You must have had some beautiful deep golden eggs. I added the lemon oil Dorie suggested and it did help give it a more distinct lemonyness. I think the addition of clove would be interesting to try. I love your dollop of whipped cream which, I confess, I would pile into an empty cup, scatter some berries over it, and call it a night..
Yummy Yummy Yummy, pass that cup over here!!! Looks great! I have to try this. Beautiful pics as usual.